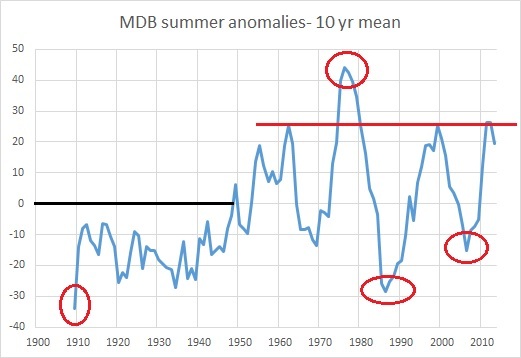 Are droughts really “more likely to occur” with climate change, and is there any evidence they are becoming more frequent, more intense, and more widespread with global warming? “Drought in general means acute water shortage. The Bureau’s drought maps highlight areas considered to be suffering from a serious or severe rainfall deficiency…. for three months or more…. Parts of central and southern inland Queensland, parts of eastern South Australia, many parts of New South Wales, and small areas of Victoria are in drought. Notice that the droughted areas are separated by areas that are not in drought. But, but… all of NSW is in drought, isn’t it? Of course the blank areas have had below average rainfall, which may turn into full blown drought, so the NSW government is being proactive. However, they are not at this time in meteorological drought with serious or severe rainfall deficiency. I do this for various regions, as shown on the map below. 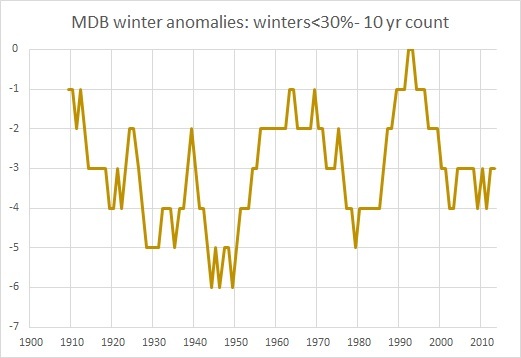 I have plotted the number of consecutive months where the 12, 18, 24, and 36 month totals are in the lowest 5% and 10% of their respective values since 1900, and calculated the trend in months per century of increase or decrease. There are 96 plots, so I will only show a couple of examples, and summarise the results in Table 1 below. A negative trend indicates decreasing drought incidence, shaded green; a positive trend indicates increasing incidence, shaded pink. 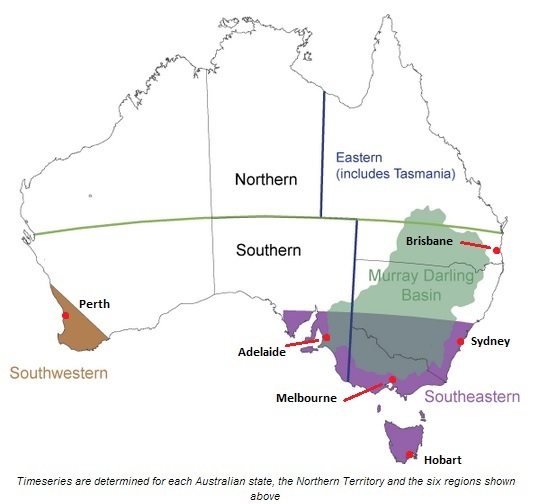 36 month dry periods are more frequent in SW Australia, SE Australia, Eastern Australia, Tasmania, Victoria, (and interestingly Queensland, but only for <10% deficiency). Some examples will illustrate the complexity of the picture. 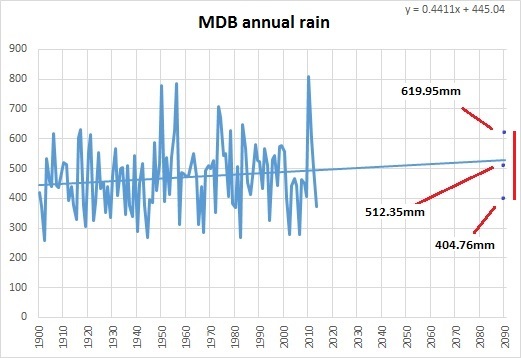 Similarly, multi-year periods of severe rain deficiency were much more frequent and widespread across Southern Australia before 1950. In the last 50 years there has been only one month where the 36 month total was in the lowest 5th percentile. Across NSW, 4 months of 2018 had 12 month totals in the serious deficiency range, but none in the severe range. 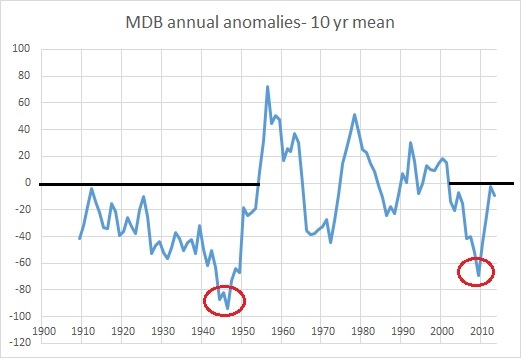 Droughts of all severity and duration have become less frequent and widespread. The Millennium Drought lasted longer but was less severe than the Federation Drought. The Murray-Darling Basin lies across four states including most of NSW, and is Australia’s premier food and fibre producing region. The current drought is affecting many areas in this region. 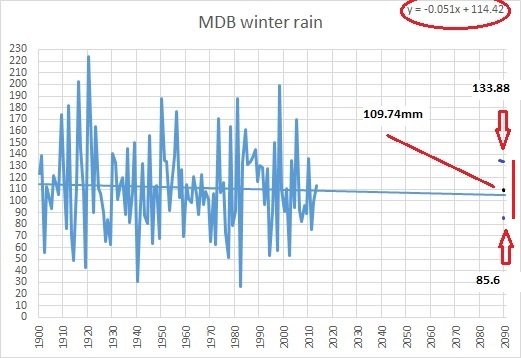 We can conclude from these plots of the Murray-Darling Basin that this drought is patchy, and while nasty, is not the most intense or long lasting even in living memory, let alone on record, and that droughts are becoming less frequent and less widespread. 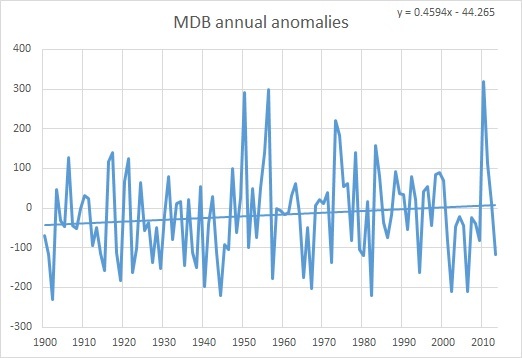 Queensland has little trend in frequency of drought with severe deficiency over three years but less severe droughts have been more frequent- due to the droughts of the 1990s and the Millennium drought. The Millennium Drought stands out as the longest period of widespread serious rain deficiency. Here we see that all but one month of all the 36 month periods of serious rain deficiency have occurred since 1970, reflecting the marked drying trend. This really is an example of climate changing. 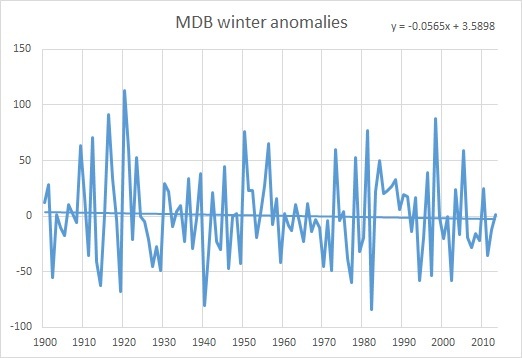 According to the Climate Council, “Climate change has contributed to a southward shift in weather systems that typically bring cool season rainfall to southern Australia.” However the usual areas affected by this southwards shift, Tasmania, south-west Victoria, southern South Australia, and most of the south-west of Western Australia, have had an average to above average winter. Droughted areas are to the north. The southwards shift of weather systems caused by Climate Change cannot be claimed to have any part in this drought. Drought is a dreadful calamity wherever and whenever it occurs. And on top of other difficulties in Queensland is the bureaucratic approval process under Vegetation Management regulations before graziers can push mulga to feed starving stock. 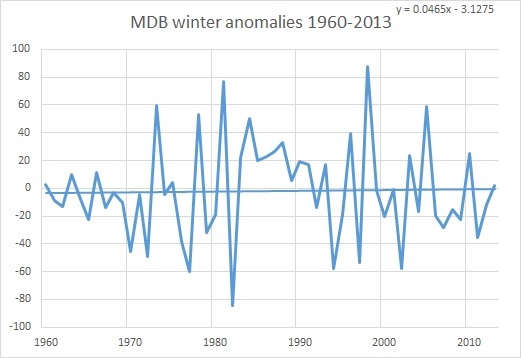 This drought may get worse if a full El Nino develops. It is unlikely to break before six months or even 18 months. By then it will be much more severe and widespread. However, climate change has not caused this drought. 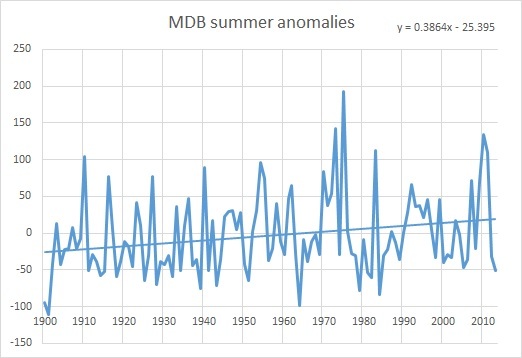 While there is evidence for increasing drought frequency and thus likelihood of more drought in the future in Tasmania, southern Victoria, southern South Australia, and the south-west of Western Australia, across the rest of Australia there is strong evidence that droughts have become less frequent, less severe, less widespread, and shorter. 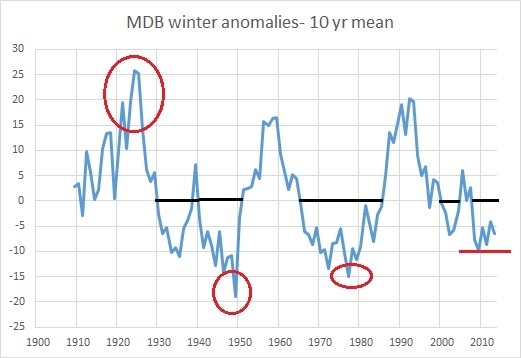 If climate change is claimed as the cause of increasing droughts in the far southern regions, then climate change must also be causing less frequent droughts across the vast bulk of Australia, where droughts are always “likely to occur”, but not “more likely”.